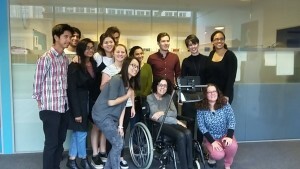 Movement for Hope was invited to teach third year engineering students at UCL about neurological conditions and Motor Neuron Disease (MND). 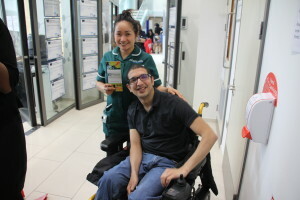 The students were at the beginning stages of developing a new prototype for a neck brace for people with MND who struggled with neck weakness. Sarah Ezekiel, Amber Michelle Hill, and Emma Biondetti helped to teach the students about brain and spinal cord diseases and MND. The students asked questions about neurological conditions and living with MND. They have now set out to develop an innovative prototype! We wish them good luck with their design and will check back with them once it is near completion! 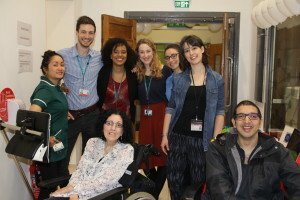 Movement for Hope attended its first International Clinical Trials Day at the Leonard Wolfson Experimental Neurology Centre (LWENC) Clinical Research Facility (CRF). 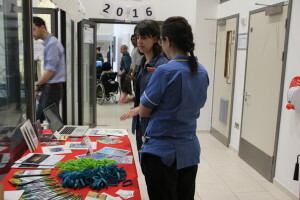 The Centre held its third annual open day on 20th May 2016, to mark International Clinical Trials Day (ICTD) at UCL Institute of Neurology. Over 100 visitors attended. ICTD celebrates the day that James Lind, a Scottish naval surgeon, started his famous study to compare six treatments as part of a 1747 prospective controlled trial to treat scurvy. This marked the start of clinical trials and clinical research. The LWENC CRF opened its doors to all visitors to meet CRF staff and learn about the CRFs latest activities. 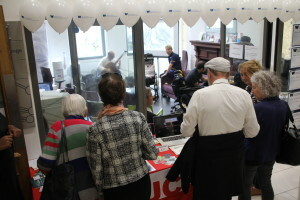 The event was very well attended, with visitors from a variety of backgrounds including neurology patients, carers, members of the general public, industry partners, charities, NHS staff and research students. 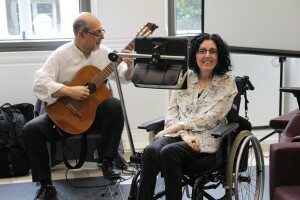 Movement for Hope’s board member, Sarah Ezekiel, was a keynote speaker at the event and collaborating artist, Martin Vishnick, a guitarist and composition instructor, delighted visitors with music at the open day. In addition to Sarah’s talk, Dr Vincinzo Libri, Head of the CRF, gave the audience an update on the CRFs latest activities. We were also pleased to be joined by friends at the Motor Neurone Disease Association, Join Dementia Research, and the Huntington’s Disease Association. Presenting an evening featuring connections between neuroscience, art and innovation. Rewired features leading neuroscience researchers, tech innovators, and top artists. Arts: live dance, live music, short theatre/dramatic arts piece, photography, virtual reality and more! 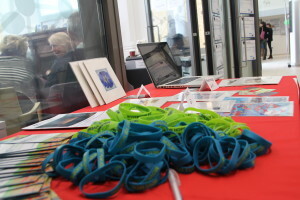 The event aims to raise public awareness of neurological conditions using artistic collaborations and cutting-edge research. *Proceeds support people with neurological conditions. The target area for the donations will be decided by the audience. For more background history on this event click the following link entitled Rewired History.